Wayne Dalton’s model 9800 is a designer fiberglass garage door that has been engineered with an artfully molded wood grain fiberglass surface bonded to durable steel construction. 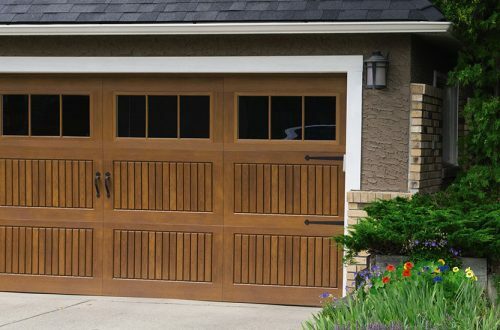 Their fiberglass garage door is as close as you can get to the warmth and beauty of wood, but without the warping, cracking or rotting of real wood. Polyurethane foamed-in-place insulation – with an R-value* of 7.6. This door can improve your home’s thermal efficiency, block street noise and make the garage door operate more quietly. TorqueMaster® Plus Counterbalance is Wayne Dalton’s exclusive counterbalance system that safely and cleanly contains the garage door springs inside a steel tube.